RectangularQuadMesh is a two-dimensional mesh of Quad elements with Nx elements in the "x" (horizonal) direction and Ny elements in the "y" (vertical) direction. Two Constructors are provided. The basic constructor assumes that the lower-left-hand corner of the mesh is (0,0) and takes only the arguments, Nx, Ny, Xmax and Ymax. The more complex constructor takes the additional arguments Xmin and Ymin. This class is designed to be used as a Base class for more complex two dimensional meshes. The virtual functions x_spacing_function() and y_spacing_function() may be overloaded to provide arbitrary node spacing. The default is uniformly spaced nodes in each direction. It is also possible to make the solution periodic in the x direction. Definition at line 63 of file rectangular_quadmesh.template.h. Constructor that allows the specification of minimum and maximum values of x and y coordinates and does not build the mesh This is intend to be used in derived classes that overload the spacing functions. THis is scheduled to be changed, however. The reason why this MUST be done is because the virtual spacing functions cannot be called in the base constructur, because they will not have been overloaded yet!! Definition at line 98 of file rectangular_quadmesh.template.h. Definition at line 120 of file rectangular_quadmesh.template.h. Constructor that allows the specification of minimum and maximum values of x and y coordinates. Definition at line 134 of file rectangular_quadmesh.template.h. Definition at line 153 of file rectangular_quadmesh.template.h. Constructor that allows the specification of minimum and maximum values of x and y coordinates. Boolean flag specifies if the mesh is periodic in the x-direction. Definition at line 170 of file rectangular_quadmesh.template.h. Generic mesh construction function: contains all the hard work. Generic mesh construction. This function contains the "guts" of the mesh generation process, including all the tedious loops, counting and spacing functions. The function should be called in all constuctors of any derived classes. Definition at line 48 of file rectangular_quadmesh.template.cc. Referenced by oomph::ChannelSpineMesh< ELEMENT >::build_channel_spine_mesh(), oomph::HorizontalSingleLayerSpineMesh< ELEMENT >::build_horizontal_single_layer_mesh(), oomph::SingleLayerSpineMesh< ELEMENT >::build_single_layer_mesh(), oomph::TwoLayerSpineMesh< ELEMENT >::build_two_layer_mesh(), and oomph::RectangularQuadMesh< ELEMENT >::RectangularQuadMesh(). Reorder the elements: By default they are ordered in "horizontal" layers (increasing in x, then in y). This function changes this to an ordering in the vertical direction (y first, then x). This is more efficient if a frontal solver is used and the mesh has more elements in the x than the y direction. Can be overloaded in specific derived meshes. Reorder the elements so they are listed in vertical slices (more efficient during the frontal solution if the domain is long in the x-direction. 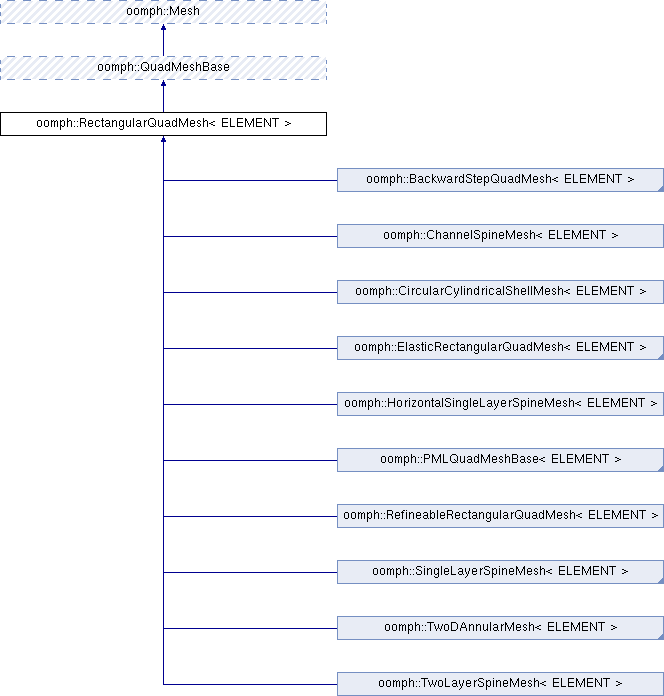 Reimplemented in oomph::ChannelSpineMesh< ELEMENT >. Definition at line 805 of file rectangular_quadmesh.template.cc. Definition at line 186 of file rectangular_quadmesh.template.h. Referenced by oomph::PMLQuadMeshBase< ELEMENT >::pml_locate_zeta(). Definition at line 193 of file rectangular_quadmesh.template.h. Return the maximum value of x coordinate. Definition at line 207 of file rectangular_quadmesh.template.h. Return the minimum value of x coordinate. Definition at line 200 of file rectangular_quadmesh.template.h. Return the value of the x-coordinate at the node given by the local node number (xnode, ynode) in the element (xelement,yelement). The description is in a "psudeo" two-dimensional coordinate system, so the range of xelement is [0,Nx-1], yelement is [0,Ny-1], and that of xnode and ynode is [0,Np-1]. The default is to return nodes that are equally spaced in the x coodinate. Reimplemented in oomph::TwoLayerSpineMesh< ELEMENT >, and oomph::ChannelSpineMesh< ELEMENT >. Definition at line 241 of file rectangular_quadmesh.template.h. References oomph::RectangularQuadMesh< ELEMENT >::Np, oomph::RectangularQuadMesh< ELEMENT >::Nx, oomph::RectangularQuadMesh< ELEMENT >::Xmax, and oomph::RectangularQuadMesh< ELEMENT >::Xmin. Return the maximum value of y coordinate. Definition at line 221 of file rectangular_quadmesh.template.h. Return the minimum value of y coordinate. Definition at line 214 of file rectangular_quadmesh.template.h. Return the value of the y-coordinate at the node given by the local node number (xnode, ynode) in the element (xelement,yelement). The description is in a "psudeo" two-dimensional coordinate system, so the range of xelement is [0,Nx-1], yelement is [0,Ny-1], and that of xnode and ynode is [0,Np-1]. The default it to return nodes that are equally spaced in the y coordinate. Reimplemented in oomph::TwoLayerSpineMesh< ELEMENT >. Definition at line 256 of file rectangular_quadmesh.template.h. References oomph::RectangularQuadMesh< ELEMENT >::Np, oomph::RectangularQuadMesh< ELEMENT >::Ny, oomph::RectangularQuadMesh< ELEMENT >::Ymax, and oomph::RectangularQuadMesh< ELEMENT >::Ymin. Np: number of (linear) points in the element. Definition at line 72 of file rectangular_quadmesh.template.h. Referenced by oomph::ChannelSpineMesh< ELEMENT >::x_spacing_function(), oomph::RectangularQuadMesh< ELEMENT >::x_spacing_function(), and oomph::RectangularQuadMesh< ELEMENT >::y_spacing_function(). Nx: number of elements in x-direction. Definition at line 68 of file rectangular_quadmesh.template.h. Referenced by oomph::RectangularQuadMesh< ELEMENT >::nx(), oomph::CircularCylindricalShellMesh< ELEMENT >::piecewise_linear_axial_bl_stretching_fct(), and oomph::RectangularQuadMesh< ELEMENT >::x_spacing_function(). Ny: number of elements in y-direction. Definition at line 70 of file rectangular_quadmesh.template.h. Referenced by oomph::RectangularQuadMesh< ELEMENT >::ny(), and oomph::RectangularQuadMesh< ELEMENT >::y_spacing_function(). Maximum value of x coordinate. Definition at line 77 of file rectangular_quadmesh.template.h. Referenced by oomph::CircularCylindricalShellMesh< ELEMENT >::piecewise_linear_axial_bl_stretching_fct(), oomph::RectangularQuadMesh< ELEMENT >::x_max(), and oomph::RectangularQuadMesh< ELEMENT >::x_spacing_function(). Minimum value of x coordinate. Definition at line 75 of file rectangular_quadmesh.template.h. Referenced by oomph::CircularCylindricalShellMesh< ELEMENT >::piecewise_linear_axial_bl_stretching_fct(), oomph::RectangularQuadMesh< ELEMENT >::x_min(), oomph::ChannelSpineMesh< ELEMENT >::x_spacing_function(), and oomph::RectangularQuadMesh< ELEMENT >::x_spacing_function(). Boolean variable used to determine whether the mesh is periodic in the x-direction. Definition at line 86 of file rectangular_quadmesh.template.h. Maximum value of y coordinate. Definition at line 82 of file rectangular_quadmesh.template.h. Referenced by oomph::ElasticRectangularQuadMesh< ELEMENT >::set_boundary_coordinates(), oomph::TwoLayerSpineMesh< ELEMENT >::spine_node_update_upper(), oomph::RectangularQuadMesh< ELEMENT >::y_max(), and oomph::RectangularQuadMesh< ELEMENT >::y_spacing_function(). Definition at line 80 of file rectangular_quadmesh.template.h. Referenced by oomph::ElasticRectangularQuadMesh< ELEMENT >::set_boundary_coordinates(), oomph::SingleLayerSpineMesh< ELEMENT >::spine_node_update(), oomph::ChannelSpineMesh< ELEMENT >::spine_node_update(), oomph::TwoLayerSpineMesh< ELEMENT >::spine_node_update_lower(), oomph::TwoLayerSpineMesh< ELEMENT >::spine_node_update_upper(), oomph::RectangularQuadMesh< ELEMENT >::y_min(), and oomph::RectangularQuadMesh< ELEMENT >::y_spacing_function().